Halloween may be my favorite holiday. Just the shear "funness" of it makes me smile, knowing it's coming up. Tramping through the pumpkin patch, looking for that perfect pumpkin. The slight chill in the air (and yes, all those people who give me grief about not liking the cold, I'm a Florida boy, remember, but I can appreciate the crispness of autumn) and sipping hot apple cider. Putting up the decorations. Buying candy for trick or treaters. Eating the candy. Buying more candy. It's a great time of year! There are so many great creepy books out there that I decided this year I'm devoting the month of October to them; the books that keep you up at night, not just because they're good but because you don't want to turn the light off, just in case the Thing Under The Bed finally decides to come out and grab you. Do I think I'll get through all of these? Maybe. Some of them are fairly short. If I don't, I don't, but at least I know I've got a good selection to sufficiently creep me out for the entire month. 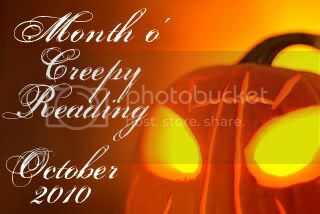 Do you plan on reading anything creepy this month? Post a comment and let us know!